By now, you all know I love sweet potatoes! In a previous blog, I wrote about some of the benefits the sweet potatoes offer and gave you a recipe for rosemary sweet potatoes. These benefits are why I love sweet potatoes so much! Plus, they are delicious and easy to use in many different recipes. One of my other favorite sweet potato recipes are these sweet potato chips. Try them for yourself by following this recipe! 2. Cut your sweet potatoes into slices. You can cut them thinner or thicker depending on your preference. 3. Place the sweet potatoes on a cookie sheet lined with foil. 4. Sprinkle cinnamon and Truvia on the sweet potatoes. I only used two packets of Truvia and it was the perfect amount. I also only sprinkled cinnamon and Truvia on one side. If you want, you can flip your sweet potatoes over and sprinkle this sweet mixture on both sides, in which case, you will likely use more Truvia packets. 5. Bake the sweet potatoes for about 35 minutes. After my sweet potatoes are done cooking, I separate them into five different baggies that I can just grab and go! This makes a quick snack, which is great for those on the go! This is a recipe for a sweeter sweet potato. If you are looking for something more savory, you can play with the spices a little! Try adding garlic powder, chili powder, salt and pepper, and whatever other spices you want to try! 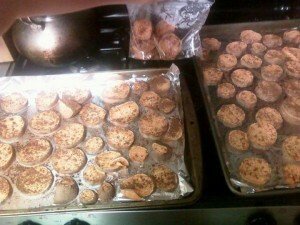 This is a quick and easy way to spice up your sweet potatoes and have a healthy snack on hand. Sweet potato chips are easy to make and easy to alter, making them your own style and to your taste. Go for savory, spicy, or sweet and enjoy them as a snack throughout the day. Try this recipe out and let me know what you think! If you try this recipe with other spices, let me know! I would love to try your recipe as well! I am always open to try new recipes and love learning what you all like. You can find more of my recipes in my cookbook called “Cook Smarter, Not Harder.” I hope you enjoy this recipe as much as I do! Make these sweet potatoes, grab a lean protein, some veggies, and be on your way with a full and healthy meal to get you through the day! So…do you put these in the frig after and eat them cold? Or do you heat them up later to eat them? Sounds yummy!